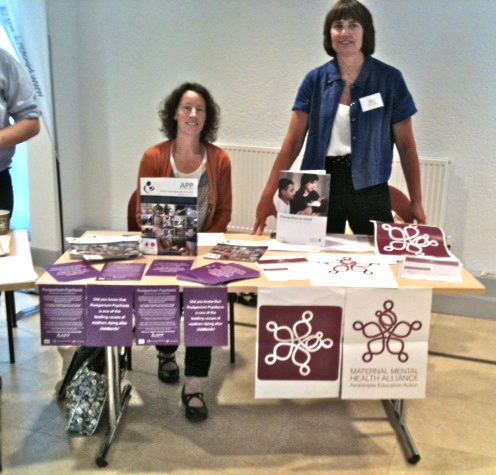 APP were well-represented at the SAPPHIRE Stigma Summit in London this month. Trustee Clare Dolman and member Ceri Rose manned the APP stall and its neighbour promoting the Maternal Mental Health Alliance. Both organisations attracted interest from many of the 400 delegates who were gathered at the Institute of Psychiatry, London, to discuss the impact of stigma and discrimination in mental health. Recorded excerpts from the Radio 4 documentary ‘Unravelling Eve’ (involving several APP members) were also played at the Summit, which was also attended by project artist Joan Molloy.